Click image for a larger image in a new window. 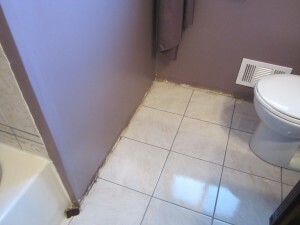 The Bathroom Flooring prior to Demolition. The Tile around the Shower by the Doorway. 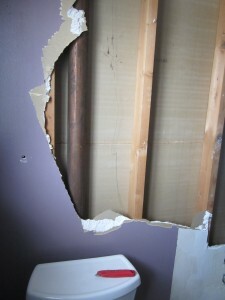 The Drywall has all been removed. 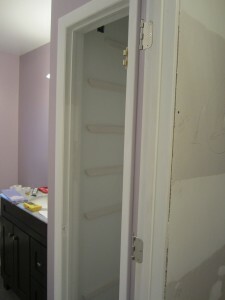 In the original configuration the Closet was accessible from the Hallway. 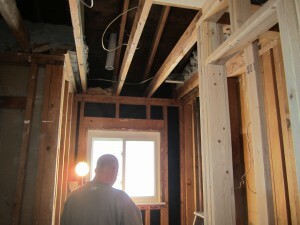 For this Project, we are turning it into the Bathroom so the contents are freely accessible from within the Bath. This is to show you where the original paper thin Insulation and all the blown in Insulation was removed to expose a bad Ventilation System. 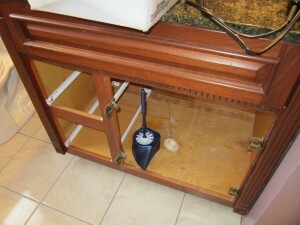 As well as to facilitate the Installation of a new Exhaust Fan and Light. 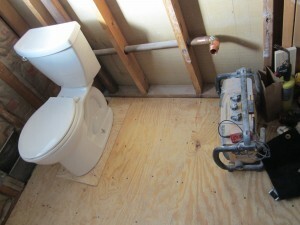 This image was taken to illustrate the fact that although this was the Homeowners only Bathroom in the House, they only went a total of two days without a functioning Toilet. 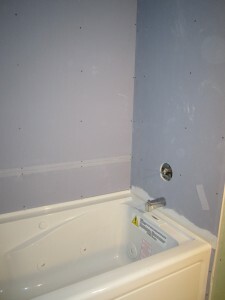 The two nights were within the Tiling phase of the Job. 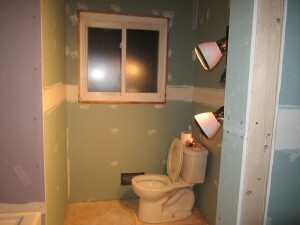 The Toilet was uninstalled every morning and reinstalled each night before we left. Also within this image, you can see the new Sub-Floor is installed. 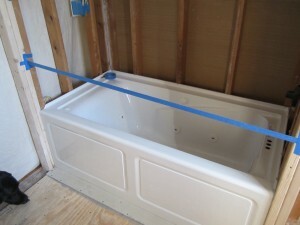 The new Jacuzzi Tub is installed! 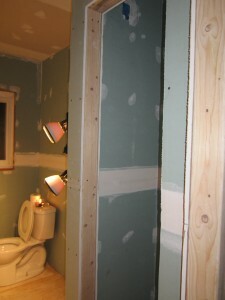 Now that all the new Mechanicals are installed, the next Phase of the Job, Drywall is able to be commenced. 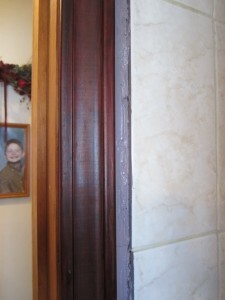 You will notice that we use “Green” or “Purple” Moisture Resistant Board throughout the Bathroom. 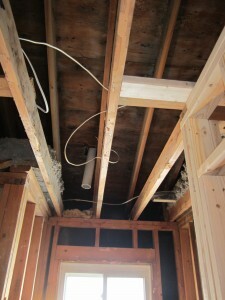 With two exceptions… USG does not recommend “MR” Board for Ceilings Framed greater than a 12″ OC. 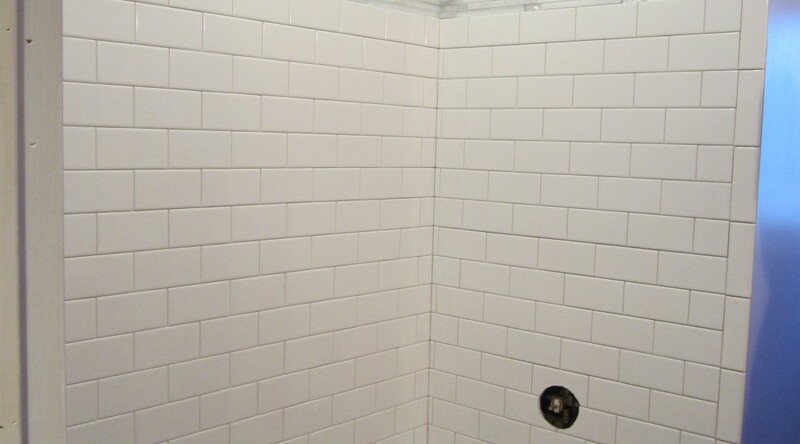 We also use a Gypsum Tile Backer Board around the Shower area as it is impervious to water and an excellent substrate for Tile. Here, on the left hand side of the image, you can see the Tile Backer spoken of in the previous image. 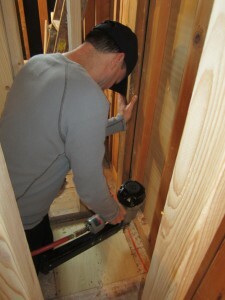 Much like the Toilet, we did our absolute best to ensure that the Home Owners did not go with out a Tub. 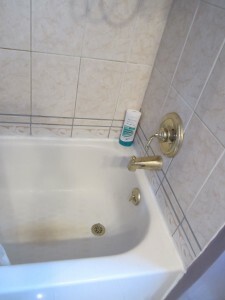 You can see the spout is installed so that the Tub was actually functional. 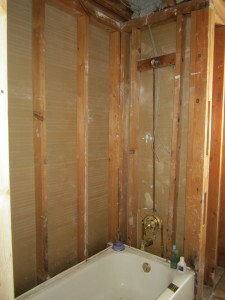 The Home Owners only went a total of 4 nights without use of the Tub during the entire Remodel. The Drywall is completely installed and Painted. 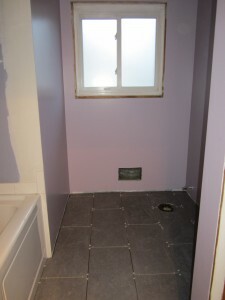 The Floor Tile is installed and awaiting Grout. 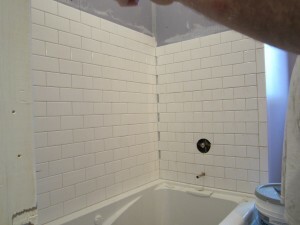 Here, the Subway Tile is being installed. 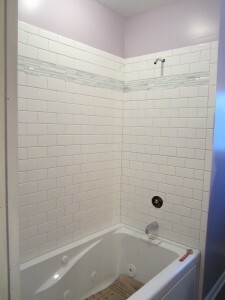 Subway Tile all installed along with Accent Glass Tile. 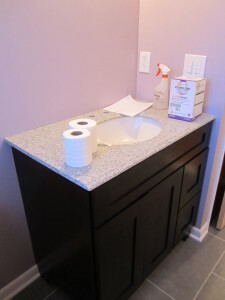 The New Vanity with the Marble Top and Sink. 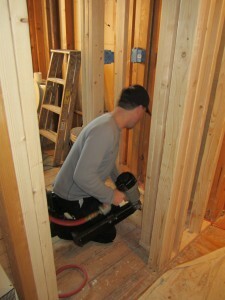 Floor is completed and most Trim Work is installed. 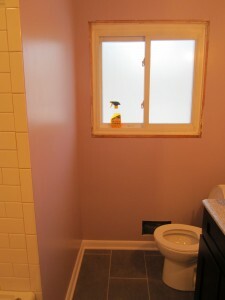 Here you can see the Window is just waiting for the Final Trim work to be installed so it can be Caulked, Puttied and Painted. 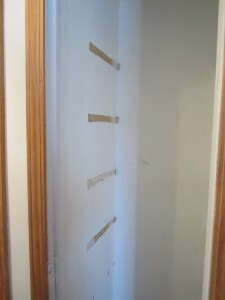 In this Image, on the right hand side you can see fresh drywall that was installed to seal off where the door used to be for the Bathroom Closet. If you like what you see and would like to inquire about a free estimate, Please feel free to Contact Us @ (585) 321- 3675 or merely use the form below. Please allow 24 hours for replies.